After two episodes full of reintroductions and some weaknesses in terms of pacing and structure, the third episode definitely starts to deliver. However, we’re not quite done with the reintroductions—or the introductions, for that matter—as this episode finally lets us catch up with yet another claimant to the throne, King Renly Baratheon. Perhaps surprisingly, all considered, he has found himself a wife since we last saw him. In this episode, he also finds himself a new member of his Kingsguard. 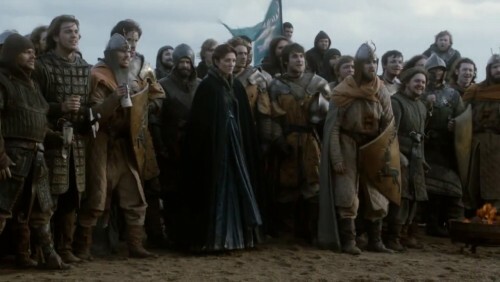 But none of this is impressing Catelyn who has been sent to treat with him on behalf of her son, Robb. It is starting to become very obvious that there are far too many kings in Westeros. Another can be found on Pyke, where Balon Greyjoy is making battle plans that place Theon in a very difficult position. His ultimate decision leads to our favourite scene of the episode, featuring both some excellent visuals and some great scoring. In King’s Landing, Tyrion gets an opportunity to show his brilliance as he takes on all three of the major schemers at the court—Maester Pycelle, Varys and Littlefinger—in order to learn who the least trustworthy (or perhaps most untrustworthy is more accurate) of them is, at least in a particular sense. He also finds a solution for Shae’s boredom at being hidden away inside his chambers, though it does not appear to greatly please either her or poor Sansa. Further north, Jon learns an uncomfortable truth to go with the headache that Craster gave him last week and in Winterfell Bran tries to get Maester Luwin to believe him when he talks about seeing things through Summer’s eyes. His sister Arya, meanwhile, finds her journey northwards interrupted as the king’s orders catches up with Yoren and his band of recruits.